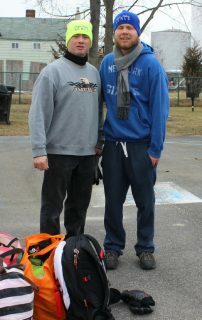 John Fox, an original Stony Point Polar Plunge Seal and buddy Brian See of Greenwood Lake prepare for the chilly jump in the Hudson. The Stony Point Seals have a “super” Sunday of their own that’s just as important as the Super Bowl. The Seals, founded 20 years ago, held its 18th annual Polar Plunge off the Stony Point seawall, despite the chilly air and the grey frigid Hudson water awaiting participants. Stony Pointer John Fox and his friends played football in the park every Super Bowl Sunday, gearing up to watch the big game. “Every year, Andy Huber and a few of us suggested we jump in the Hudson and one year a few of us did it,” said Fox. “Someone took a photo and hung it up in Bee’s Country Deli on 9W. The owner suggested they pay it forward and do something with it.” That’s when the Stony Point Seals Solar Plunge became part of the town’s history. Three Rockland County children will benefit from the proceeds from the event: Angelica Hicks, Aiyanna Faria and Aris Gomez. Each year, children with high medical bills are helped by proceeds from the event. Several fire departments participated, including the NYCFD. “This is something every community can do to help their neighbors,” said one of the NYPD crew. Nam Knights, along with other motorcycle clubs, came with flags flying to show their support. With a 50-50 raffle and prizes, food, hot coffee and homemade baked goods for hungry supporters, the event was a warm reminder of the good people can do when they take the plunge—even if the water is only 30 degrees!